This cosmic close-up looks deep inside the Soul Nebula. 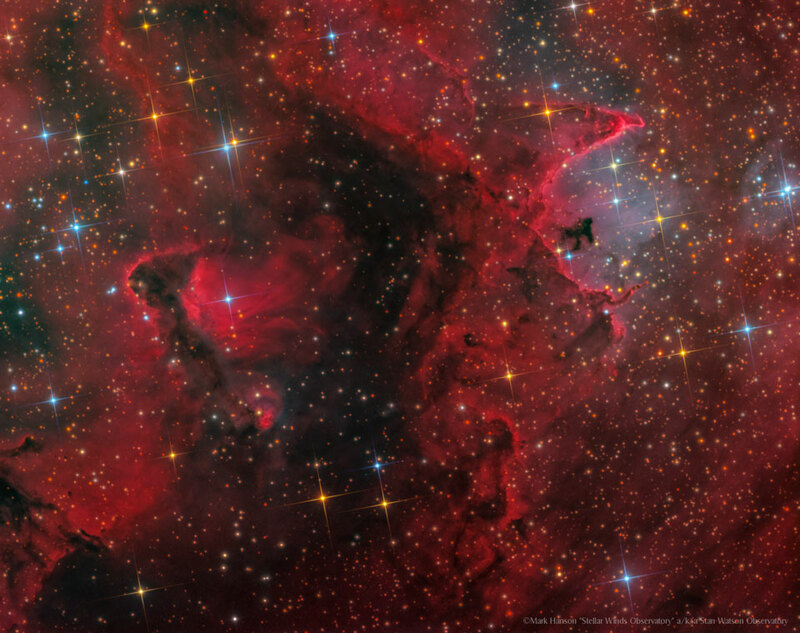 The dark and brooding dust clouds on the left, outlined by bright ridges of glowing gas, are cataloged as IC 1871. About 25 light-years across, the telescopic field of view spans only a small part of the much larger Heart and Soul nebulae. At an estimated distance of 6,500 light-years the star-forming complex lies within the Perseus spiral arm of our Milky Way Galaxy, seen in planet Earth’s skies toward the constellation Cassiopeia. An example of triggered star formation, the dense star-forming clouds of IC 1871 are themselves sculpted by the intense winds and radiation of the region’s massive young stars. The featured image appears mostly red due to the emission of a specific color of light emitted by excited hydrogen gas. Posted on Wednesday, 28 November 2018 by VGC	This entry was posted in ifttt-photograph and tagged IFTTT, NASA. Bookmark the permalink.